A Christmas Story came out in 1983, and my family has watched it pretty much every year since. It is permanently tied to my memories of Christmastime. I can quote from it endlessly. I know not everyone is a fan, but as far as I am concerned this is one of the funniest, most spot-on portrayals of a child’s experience of Christmas I’ve seen. It’s not a movie with a grand romance; there’s no holiday miracle or Santa-Claus-is-real reveal; it’s just a kid being a kid and dreaming of a toy he wants for Christmas, as kids do. 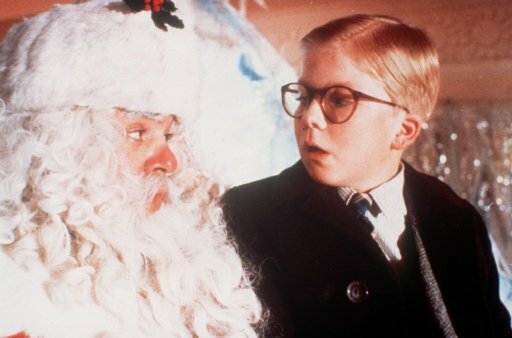 Even though the film is set in the ’40s, and the family isn’t really much like my own, I can relate to a lot of the moments in A Christmas Story. I remember being forced into an uncomfortable snow suit as a small child, the family going out to a lot to find a Christmas tree each year, that moment of quiet contemplation after all the gifts have been opened and the wrapping paper carnage still covers the floor. I remember stupid playground double-dog dares, and desperately hoping and dreaming about that one gift you pray you’ll be getting on Christmas morning. One year I picked a stuffed animal out of a catalog (probably the Sears Wish Book—remember those? ), and I carried the picture from the catalog around with me for weeks, I was so excited. And while I don’t remember ever being traumatized by a department store Santa, even that may have happened at some point. One of the things I think A Christmas Story gets right is how big the small things can seem in a child’s life. The epic importance of a secret decoder ring and the dejection when it doesn’t live up to expectations. The feeling of DOOM when you know you’ve upset your parents. The way Christmas can feel like the most important day of the year—at least until some other important day comes along. And A Christmas Story manages to poke fun at this but also kind of respect it. I also like how real the parents seem: they’re flawed but loving. 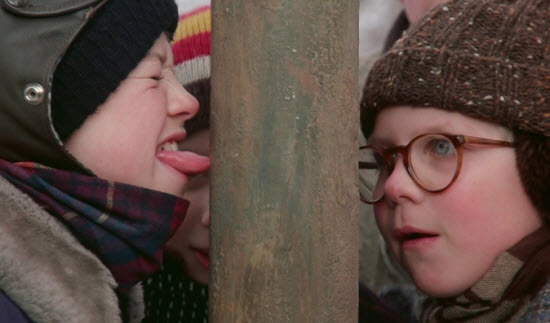 I will close by saying that I remember a huge debate on the school playground after this film came out about whether your tongue actually would freeze to a flagpole in the winter. My god, kids are stupid. Lucky for us, winters in Washington State weren’t usually quite as frozen as the one in A Christmas Story. Seriously, kids, sometimes you should believe what you see on TV. Tune in tomorrow for Day 23: White Christmas. Amen to everything. But, oh-my-gawd- did you get the stuffed animal? Please tell me you did, because it’s too late to order out of the Sears Wish Book! Never fear, I got the stuffed animal! As I recall, it was a hedgehog sort of thing, and I think it could sort of roll into a semi-ball that was maybe held together with a button? I don’t think I am explaining this well. Oh yes! I remember it well. What a relief.